"Old City Hall : Portland Maine, 1825." Old City Hall : Portland Maine, 1825. 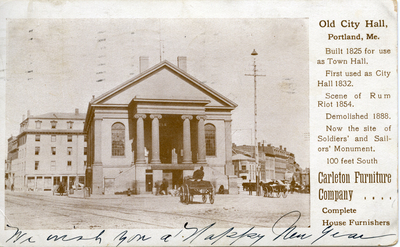 Old City Hall, on Market Square (now Monument Square). "Built 1825 for use as Town Hall; First used as City Hall 1832; Scene of Rum Riot 1854; Demolished 1888. Now the site of Soldiers' and Sailors' Monument." Advertisement for Carleton Furniture Company... Complete Household Furnishers, 21 Monument Square. Postcard mailed 28 Dec 1905. "Old City Hall : Portland Maine, 1825." (2017). Portland Postcards. 32. Old City Hall, Market Square, Monument Square, Portland, Me.